See that goal by Finland against Canada? It's good for hockey. Yes, it was disappointing to see the Canadians lose on home soil tonight, but this isn't some random tournament filling a void between major competitions. This was the IIHF World Junior Championship, and I'll say that Finland's win tonight - don't call it an upset - and Switzerland ousting Sweden earlier in the day makes this tournament infinitely better. Hear me out on this. If there is more variety to the finalists outside of the main three we saw in the 1990s in Canada, Russia, and Sweden, countries will invest in their junior programs and minor hockey programs. Finland has been a gold medallist a couple of times in recent history. The United States has worn gold around their necks. These two countries are producing incredibly talented players over the last decade after they invested in their programs so that players like Auston Matthews, Patrik Laine, Matthew Tkachuk, and Mikko Rantanen excel rather than being left behind in an underfunded system. Countries like Denmark, Germany, Slovakia, and Kazakhstan will be looking to model their systems after the Swiss and Finns in seeing their successes, but it's not going to happen overnight. It may take a decade or longer due to the investment needed to nurture and develop highly-skilled hockey players in those countries where the hockey infrastructure - rinks to play on, programs to join - may not be equivalent to where the Swiss and Finns currently are. That being said, it will take some time for the up-and-coming countries to put the facilities and programs in place before they begin to discover kids with immense talent in places where there were no facilities. If there's one thing that I believe that all of Canada can agree with, it's that every country on the planet has closed the talent gap between them and Canada. That should worry the folks at Hockey Canada, but it should make for better tournaments overall because it's no longer a free pass to the final for Canada. That's good for hockey. Canada and the US have a reported 1.2 million ice hockey players registered between the two countries. That number eclipses the number of ice hockey players on the rest of the planet combined. Further to this, Canada's reported 8300 ice hockey rinks outnumbers the rest of the world combined. Perhaps we're stressing the wrong things when it comes to our hockey greatness because the fact that we have the most players and rinks isn't panning out to produce the most medals and champions. And just because we have the most rinks and the most players doesn't mean we're producing the best players either. There was a watershed moment for two countries in the 1970s when the Soviets and Canadians met in the Summit Series in 1972. The Russians recognized that their style needed to adapt to the physical play that the Canadians brought while the Canadians had to figure out how to match the incredible skill that the Russians displayed. As the Summit Series progressed, both sides adapted to the other's style and we saw the series begin to even out after the Russians had baffled the Canadians across Canada. "That team that went over to Canada in 1972 were pure Soviet players," former Winnipeg Jet Oleg Mikulchik told CBC in 2000. "They had been taught to see hockey as a game of gentlemanly manoeuvres, almost like chess on ice. They were amazed at the rabble-like Canadian attack, and stunned by all the body checking. But they adapted and taught the Canadians a thing or two. We've all benefited from what they learned in that series." It's funny how Canadians cling to and defend that physical brand of hockey as "Canadian hockey" when the guys we often associate with winning - Wayne Gretzky, Mario Lemieux, Bobby Orr, Sidney Crosby, Connor McDavid - are often highly-skilled players who play physical to win puck battles, but rarely drive opponents through the end boards. Why do we constantly seek the most physical players when the most talented teams often win? Eeli Tolvanen was a thorn in Canada's side tonight, but he wasn't out there bouncing off players like a wrecking ball. Instead, he did most of his damage by putting shots on net and setting up teammates for opportunities. Is this not the type of team Canada should be striving to build in future tournaments? I can hear some of you saying that the goaltending by Finnish netminder Ukko-Pekka Luukkonen had an outstanding game, and I won't deny that. However, he was matched save for save by Canadian netminder Michael DiPietro in a game that was literally a "next goal wins" battle. 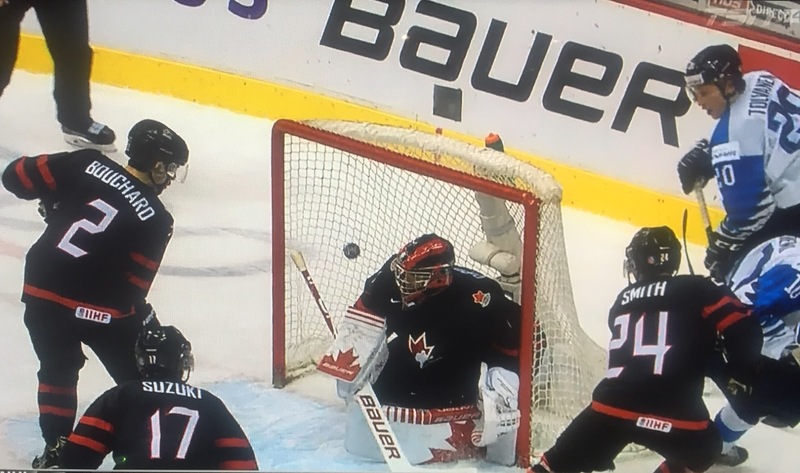 For the first time in a long time, Canada was buoyed by goaltending in this tournament rather than searching for someone to step up when the games mattered. DiPietro deserves the praise that the crowd showered on him yesterday because the Canadian goaltender deserved a better fate after his performance. We've seen Finland win before, so losing to them will never be called an upset on this blog. The fact that Finland continues to win despite missing some key players shows that their system is working. And while they may not have the facilities or the population enrolled in hockey like Canada does, their system is churning out exceptional players more and more often. Don't believe me? In 2015, Mikko Rantanen was the only top-ten Finnish NHL draft pick and he went tenth-overall. In 2016, three of the top five players chosen were Finns in Patrick Laine (2nd), Jesse Puljujarvi (4th), and Olli Juolevi (5th). In 2017, Miro Heiskanen went third-overall. And in 2018, Jesperi Kotkaniemi went third-overall. While I've pointed out in the above paragraphs that Finland closed the gap on Canada and the world, the last two decades haven't produced a ton of precious metal for the Finns. They've won three golds, a silver medal, and four bronze medals - eight years of medals - in 20 years of play. However, in the last six World Junior tournaments, Finland, Canada, and the US have all won two gold medals apiece. In the last 20 years, Canada has seven gold medals, seven silver medals, and three bronze medals. Clearly, Canada is still producing talent that can earn accolades, but the last decade of play has seen five countries win gold medals while six teams have medalled (Slovakia won bronze in 2015 when they upset Sweden 4-2). The world is catching up to the Canadian standard of play at the World Junior Championship. And that brings me back to countries like Denmark, Germany, Slovakia, and Kazakhstan who witnessed the Swiss shutout the Swedes 2-0 today. The last time the Swiss medalled was in 1998 - their only medal - as they captured the bronze that year when they beat the Czech Republic 4-3. With the Swiss advancing to the semi-final today, they'll have a chance to add a medal to their total of one in 39 appearances at this tournament. For Denmark, Germany, Slovakia, and Kazakhstan, this just reinforces the fact that continuing to build their programs will close the gap between them and the rest of the world who play in this tournament annually. We already witnessed the Germans defeat the Canadians at the Pyeongchang Olympics to advance to the gold-medal final, and the result of that win reportedly sent enrolments in ice hockey in Germany to an all-time high. If the Germans can keep this momentum going, they could be a force to be reckoned with in the coming years. I'm not saying they'll rise up and beat a Russia or Sweden or Canada next year or the year after that. However, as their players seek better opportunities to hone their skills, we'll see some of these teams become fixtures at the tournament which will only ramp up the competition even more. People have talked about reducing the number of teams from ten to eight at the World Junior Championship to prevent games like the Canada-Denmark game from getting out of hand. I believe this would do a disservice to those countries still developing their programs as they want to play against better teams in order to learn from them. Exhibition games don't accomplish the same thing as competition games do, and blowouts will happen on occasion. Every once in a while, though, there will be a team who hangs with one of the superpowers. They may not win, but they don't have to win. Instead, they'll adapt like the Soviets did in '72. They'll learn like the Canadians did in '72. They'll take those lessons back and implement them into their systems and programs like the Finns have and the Swiss have. And maybe one day down the road, we'll be talking about Germany beating the Canadians in the quarterfinals or the Kazakhs winning their first medal in taking down the Russians or the Danes knocking off their Nordic neighbours. It won't happen overnight, but having the favorites lose in major tournaments like Canada and Sweden today is good for the global game when it comes to the smaller hockey nations strengthening and improving their programs. Countries are catching up to the five superpowers in junior hockey, and it makes for a far more exciting tournament when every game counts!